Glasgow's Whisky Festival – Bringing Scotland's national drink to Scotland's national stadium. 2019 Tickets On Sale Next Saturday! Our 2019 tickets go on sale at 11am on Saturday 23rd of March online and in person from Tickets Scotland and in person only at Bon Accord. As soon as we have the direct link for Tickets Scotland we’ll be sure to pass that on to you. Keep your eyes on our Social Media pages for all the details and announcements of exhibitors as we book them from now until the date of the festival. Tickets are £40 each (plus booking fee from Tickets Scotland). Each ticket includes two £5 vouchers for the shop which can be redeemed against any 50cl or 70cl bottle (one voucher per bottle). There are no tickets available before the 23rd at 11am, so please don’t ask us. It’s our 10th Anniversary this year which means we’ll be planning a few extra treats so make sure you don’t miss this one! Don’t set one alarm, set two! Write notes on your calendars, set up reminders on your phones or tie pieces of string around your pinkies. Whatever you do don’t miss our 2019 tickets going on sale at 11am on Saturday 23rd of March from Tickets Scotland and in person at Bon Accord. Tickets are £40 each (plus booking fee from Tickets Scotland). See the Tickets page for more details and keep an eye on our Social Media for updates. Please do not ask us for tickets before this date or we will talk about you and your ears will burn. Win Tickets For 2019 With Our Food Bank Collection! Last year at Glasgow’s Whisky Festival we decided to hold a food bank raffle to collect goods for Drumchapel Food Bank in Glasgow. This food bank provides a lifeline to many of the poorest families in the city and is something we really wanted to help with. The experiment paid off and we filled two vans with food and toiletries, thanks to your generosity! It was so successful we are doing it again this year. All you have to do is bring along as many items on the list below as you wish and we’ll exchange them each for a raffle ticket. The more you bring the more chance you have of winning tickets for next year. It’s that simple! Take the list below with you when you do your food shop this week and help us to help those less fortunate than ourselves in Glasgow. We’ll be drawing the winners live on Facebook next week from Bon Accord so keep your eyes peeled for news of when that will take place and good luck! Fewer Than 7 Weeks To Go! We’re working away behind the scenes to bring you the biggest and best festival yet, and can confirm we have over 65 stands booked with more to follow! This will be a new record for us again as we continue to grow every year to bring you as much choice from around the globe as we possibly can, all under one roof in Scotland’s National Stadium, Hampden Park. Our announcements are coming thick and fast on our Facebook, Twitter and Instagram channels and you can see the current list of those we have revealed on the Exhibitors page right now. Recent posts include The Scotch Malt Whisky Society, Glengoyne and Speyburn. We also have world whiskies available to sample on the day such as Mackmyra from Sweden and Paul John from India. There are just a few tickets left for Session 2 which you can purchase from Tickets Scotland or Bon Accord (in person only) in Glasgow. See the Tickets page for more info. Who are you hoping to see there on Saturday 10th of November? Keep your eyes peeled and you just might see them announced very soon! The First 2018 Exhibitor Announced! 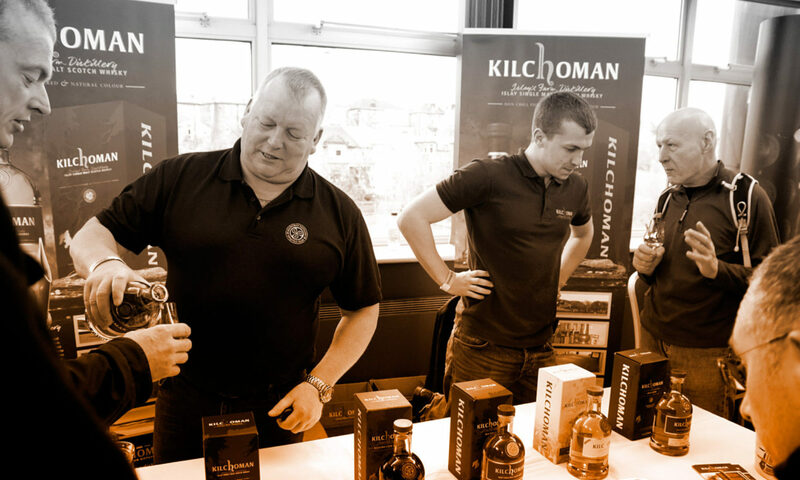 We’re delighted to kick off our exhibitor announcements for this year with Indie Brands who’ll once again have their flagship Isle of Arran whisky and Brockman’s Gin with them amongst other tasty spirits. Save the date! We’re back at Hampden Park on Saturday 10th of November 2018 with another two sessions! Tickets will be on sale on Saturday 31st of March 2018 from 11am. There are two sessions: 12pm-4pm and 5pm-9pm. Keep an eye on this website and our Social Media for more details in the New Year! Do you have any of these tickets? If so you are coming to Glasgow’s Whisky Festival 2018 with a partner or pal for nothing! Check your purses, wallets and pockets. Most have now been claimed via Facebook. You can watch the draw, which took place on Monday live from Bon Accord, on our Facebook page. If you are clutching one of the winning tickets please drop us an email or message and we’ll make sure you’re joining us next year for another cracking gathering of whiskies. Thanks again to everyone who took part in our foodbank raffle for Drumchapel Foodbank and we hope to do the same again next year! Foodbank Raffle Draw Live Today on Facebook! First of all, we hope you all enjoyed our festival on Saturday. Our first double-header went down a storm with exhibitors and guests alike. Hopefully you will join us for the same again next year! Today at 3pm we will draw the winning tickets for our foodbank raffle which was in aid of Drumchapel Foodbank. We are absolutely amazed by the response. Pictured above are just some of the donations from the first session alone! Join us on Facebook live from Bon Accord in Glasgow, our spiritual home, for the draw at 3pm and have those tickets ready! Don’t worry if you can’t watch as we will post the winners across all our Social Media, here on our website and via our mailing list. Thank you again from us all and good luck today!